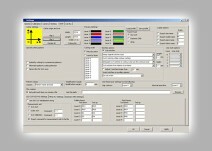 Kuris software application that carries out advanced control of cutfiles removing overlapping lines by means of overcut control. The New Cutter Export Settings window provides flexible control of cutter operation, layer management, cutfile post-processing: overlapped lines removal, overcut control, cut order, start point options, etc. Integrating Kuris CAD software with any cutter is now easier than ever.